Is Yours an Innie or an Outie? Most of us can answer pretty quickly about whether we have an innie or an outie, if we’re talking about belly buttons. Whether you end up with an innie or an outie is usually a matter of chance. Most people end up with innies, but some people have outies. Outies usually occur when more of the umbilical cord is left when it’s cut, leading to more skin left over once it dries out. While it may not be as simple as lifting your shirt and looking down, can you identify whether you are part of an innie church or an outie church? What’s the difference? Outie churches are strong and healthy within, but focused on reaching those outside the church. Innie churches are most concerned about keeping those already in the church engaged. Outie churches are deliberate about engaging their community with good deeds and the good news of Christ. Innie churches integrate activities and programs in the church, but fail to engage the community. Outie churches emphasize their influence and impact on the community everyday of the week while innie churches emphasize how many attend on a given Sunday. Outie churches will be greatly missed by the community if they cease to exist while most innie churches aren’t even noticed by the community. Take a look at your church’s calendar or budget and it too, will help to determine whether you’re part of an outie or an innie. Is the biggest portion of your budget spent on missions, engaging the community and reaching the lost? Or is it allocated for maintaining buildings, church programming and keeping the already baptized believers content? The activities and ministries on your churches calendar are just as telling. 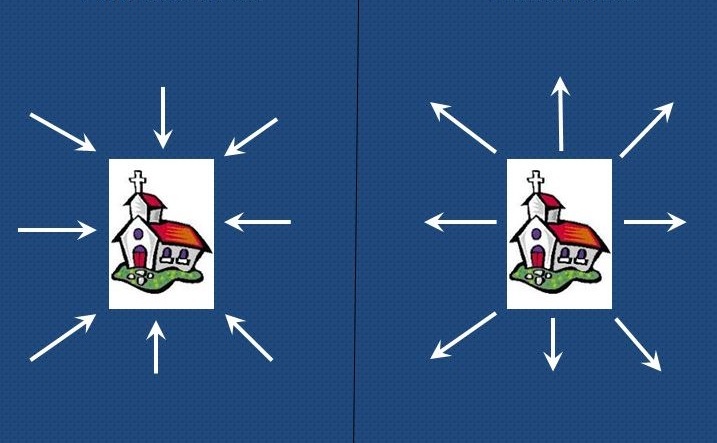 Do they indicate that your church is an innie or an outie? A study by Lifeway Research showed that 78% of those surveyed believed the church was more concerned about organized religion that it was engaging and caring for their local community. Whether it’s true or not, that was their perception. What is your church doing to disprove that belief? Outie churches discover the needs in communities and develop ministries to address those needs and share Christ. You can’t control whether you have an innie or an outie belly button, but you can control whether your church is an innie or outie. Take steps to move your church from being an innie to becoming an outie. Assess the needs of your community, move your congregation from the seats to the streets in meaningful ministry, equip members to share Christ in the course of their daily activity, develop new ministries to reach those still unreached, and partner with ministries already plugged into your local community. The way to inwardly build a strong and healthy church is through external service and ministry. Will you accept the challenge to become an outie? The Missions Mobilization Team of the Kentucky Baptist Convention has assessment tools, resources, training, networking and grants to assist your church in becoming more externally focused. Call or email for assistance. Mobilization is a process. The simple definition of mobilize (mo / bi / lize) from Merriam-Webster’s online dictionary states, “to bring (people) together for action, to come together for action, or to make (soldiers, an army, etc.) ready for war.” According to this definition the point of mobilization is action. We do not simply want to talk about missions; we want to bring people together and make them ready to do missions. However, missions is not done just any way we choose. We mobilize people for action in missions in order to be biblically faithful and effective. Biblically faithful missions is not missions, regardless of the good we may do, if the gospel is not central in what we do. Essential to biblically faithful missions is a clear presentation of the person and work of Jesus. People must know who He is and what He did for sinners. Being biblically effective in missions is closely tied to being faithful in missions. If the gospel is unclear in our attempt at missions, then we can be sure our effectiveness in missions will be no greater than the work of the Salvation Army. While we are called to acts of mercy, we are no different than any other humanitarian organization if all we do is clothe, feed, shelter, or medicate. Effectiveness in missions is inseparable from faithfulness in missions—faithfulness to the gospel message. Effectiveness is also closely connected to contextualization. A. Scott Moreau is helpful in his discussion on contextualization. Without desiring to oversimplify it, he states that contextualization “is to plant the universal gospel in local soil. It is not to change the gospel, but to plant it in such a way that what grows in local soil can be seen as a local plant. . . . Contextualization is what it takes to plant the gospel message and the life of the church into a particular setting (or context), whether it is in Barcelona or Beijing” (“Comprehensive Contextualization,” in Discovering the Mission of God, 406). Being effective in missions requires a careful understanding of the local context in order to reach the local people with the universal gospel. Learning culturally appropriate ways to engage people with the gospel is crucial for biblically effective missions to occur. Mobilizing believers to be faithful and effective in missions is ultimately the responsibility of the local church. Whether sending long-term, mid-term, or short-term personnel on mission, churches must equip their people to be faithful and effective in the Great Commission. We can boil the Great Commission down to making disciples locally and globally for the glory of God. Each church is called to make disciples in their neighborhoods and in the nations (Matt 28:16-20; Acts 1:8). In other words, churches are tasked with mobilizing their people for global gospel impact. Often I have said, “When I get up in the morning and start my work day, I never know what a phone call or email may bring.” On June 7, while not in my office, but at a Lexington hospital with my sister, I received one of those calls. Missionary Keith Decker, with Cedaridge Ministries in Williamsburg, called with one of his “unusual” questions. “Do we have any ministries in Hardinsburg that could use a building?” he asked. He went on to share with me that he had been approached by a pastor now living in Williamsburg, that had a building in Hardinsburg that he would like to donate for ministry. My reply was, “I don’t know of anything off the top of my head but let me make a phone call or two.” Not knowing of any particular ministry in that area, I looked up the phone number for the Blackford/Breckinridge Baptist Association and called new Director of Mission Brent Thornton. “Are you the lady I met at the DOM Retreat?” he asked. I said that I was and told him why I was calling. I didn’t know if he was going to shout, cry, pass out, or have a heart attack. He could not believe his ears. Then he went on to tell me his story. Brent had only been in the DOM position for four months when, near the end of April, a gentleman had walked into his office and asked if they would be interested in selling the building that had housed their office for the past 35 years. The man made them an offer and the association voted, just a few days before I called, to sell their current building. They were going to have to find temporary office space almost immediately. He had been so concerned about where they were going to move. Now, he gets a call, totally out of the blue, about a building and 1 ½ acres being offered to them…for free. On July 5, almost one month from that initial call, the property was deeded to the Blackford/Breckinridge Association. The facility, once used as a church building, has pews, furniture, a keyboard, and office space. And, while it is far from move-in ready, it offers incredible potential for ministry. The facility may never be used as the association office but it is definitely in their long-range strategy for ministry. It is in a great location, is structurally sound, and has a building with over 3000 square feet of ministry space to be used for the Kingdom. “It is not hard to see God’s hand I the timing of this,” Brent said. God has blessed me to share in just a small way in many stories such as this. How exciting to see Him at work. I am just waiting for that next phone call. On June 23, torrential rains struck West Virginia, which caused severe floods that took 23 lives, destroyed or severely damaged over 500 homes, and left over 60,000 without power. A federal disaster declaration was issued for the counties of Fayette, Clay, Roane, Summers, Monroe, Greenbrier, Kanawha and Nicholas. 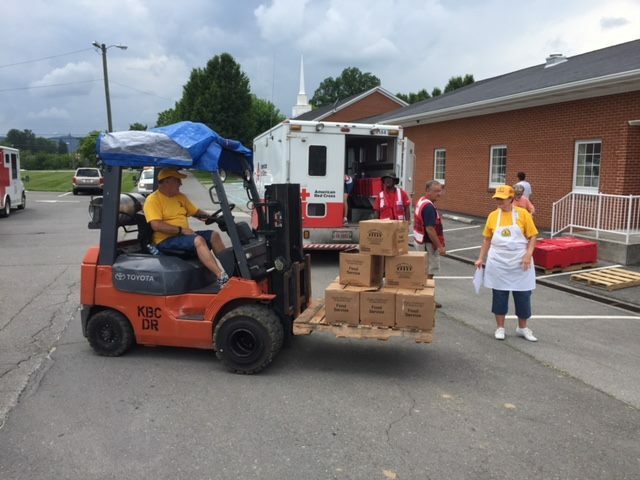 Kentucky Baptist Disaster Relief volunteers were among the first to respond and have been joined by Southern Baptist Disaster Relief volunteers from West Virginia, North Carolina, Ohio, Florida, Tennessee, and the Southern Baptist Conservatives of Virginia. It is likely that other states will soon join this massive relief effort. Southern Baptist Disaster Relief teams are on the ground providing cooked meals, hot showers, laundry assistance, damage assessment, chainsaw work, and flood clean-up. 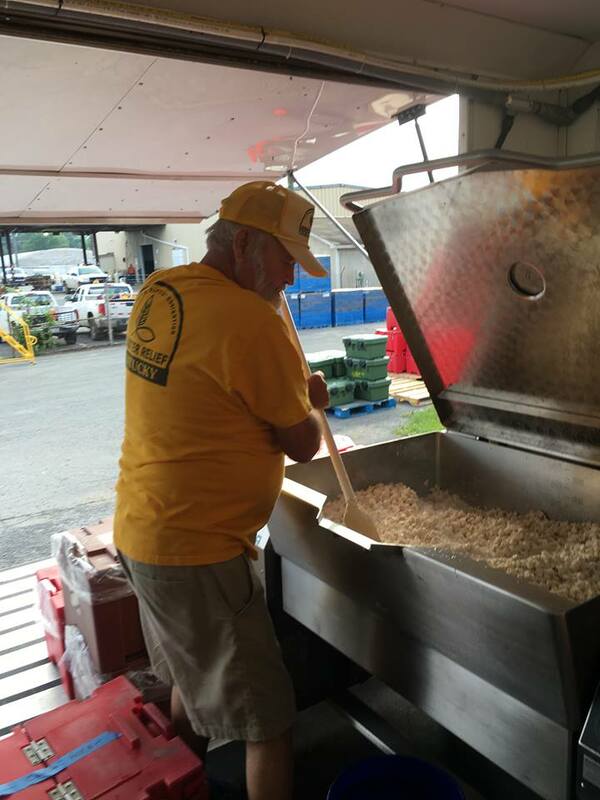 The Kentucky Baptist feeding team and mobile kitchen has provided over 22,000 meals, to date, in hard hit Greenbriar County, and is still serving at Fairlea Baptist Church in Ronceverte, West Virginia. Other Kentucky Baptist Disaster Relief volunteers are assessing damage and providing flood clean-up for homes in Kanawha County. The response is likely to continue for weeks. Kentucky Baptist Disaster Relief is bringing practical help, genuine healing, and the hope of Christ to the weary and hurting across West Virginia. The presence of these faithful volunteers reminds our neighbors that God cares about them.